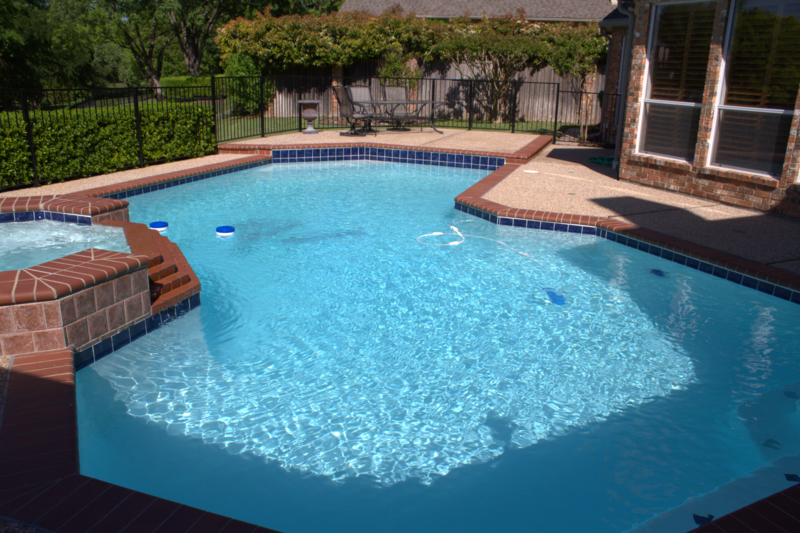 Before and after clips of a residential swimming pool renovation in Plano, Tx. by Executive Pool Service ~ McKinney, Tx. We replaced the tile and re plastered the swimming pool and spa. Not only do we pay attention to detail in regards to aesthetics but we build things to last. As a former builder with hands on experience in all phases of swimming pool construction, I know how to resolve issues once and for all. Specializing in tile and coping repair / replacement, re plaster, deck-o-seal replacement, filter cleans and re plumbing equipment pads in the McKinney, Tx. Call today for a free estimate (469) 254-7725. Previous Previous post: New plaster and tile on an old pool can do wonders! Next Next post: Best Heavy Duty Pool Skimmer Basket when there’s lots of leaves!